Almost as soon as I had finished my last page with the face of a girl, I wanted to do another one. But I wanted a smaller face and some body. I feel like I really need to work on my eyes and noses ... but I guess it will come. She kind of surprised me how she kept developing. I used a base of acrylic paint and then added watercolour pencil, some of which I diluted and some was left. 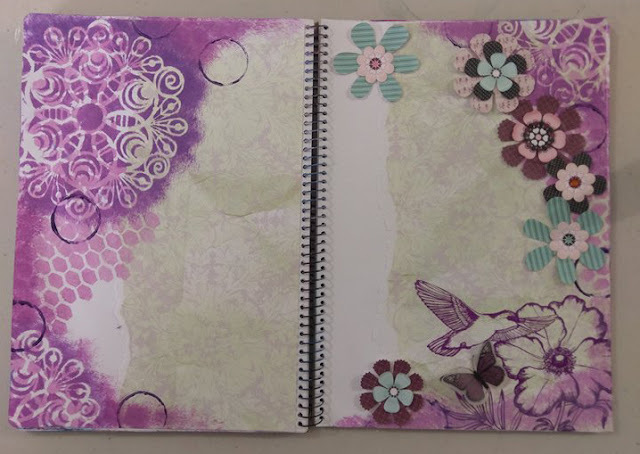 Once the basics of the angel were done I used Gesso on both pages and started layering. I wanted a fairly soft, uncomplicated look to the page, so I didn't over do the layers. The letters of ANGEL were stamped in black ink. It's not that obvious in this photo, but I added some little sparkle embellishments, gold and red stars and a diamonte on the heart. She is helping me hold my heart because sometimes it gets heavy. Thanks again so much to Brenda and her blog party. I hope you have enjoyed seeing my page. Thanks for your comment on my blog re Memory Box stencils. I have the Lathenay and the Heartwood, and you are quite right, that was the one I used for my make, - well spotted! Don't know why I didn't follow before Jenni, but I am now. 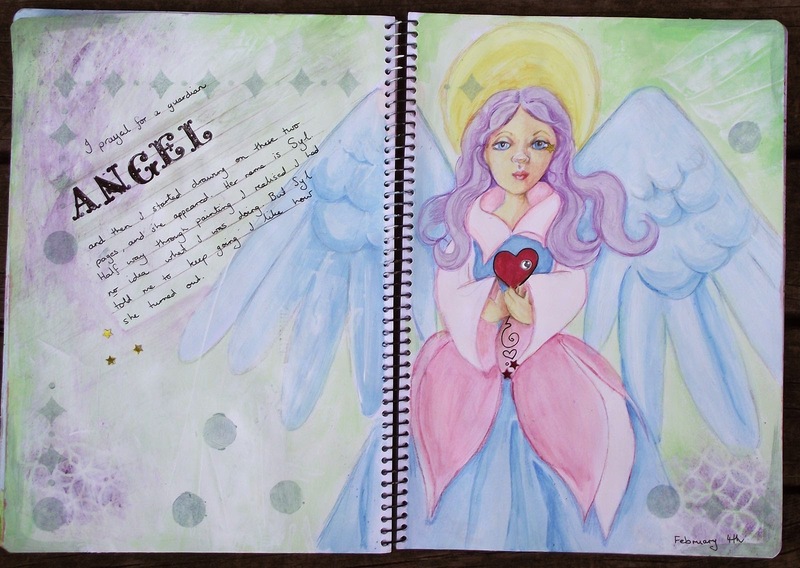 Love your Angel she is beautifully drawn and coloured and makes these great pages stand out. 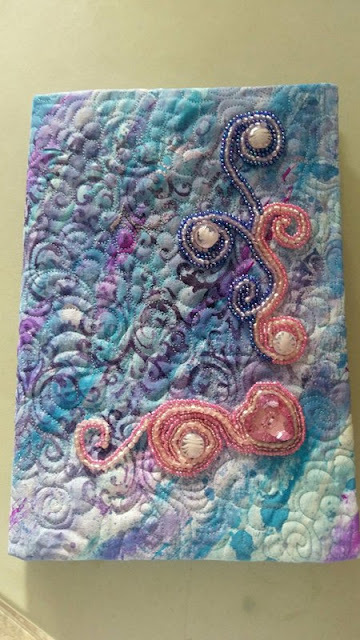 I love the little embellishments you added, I enlarged the photo so I could see them properly and the pastel colours and touches of stenciling work perfectly. Thanks for staying with me on my Visual Journey, it's so lovely having you link each week. Have a great week and a light heart. My heart does feel lighter every time I draw in this journal. I am so happy I rediscovered this great method of expression. Thank you so very much for following my little blog. I have tried and tried to do faces, but they look like monsters, I think your face is very very acceptable and as you are quite happy to work on the noses you are only going to become so much better...I Love the page as you state it is soft and quiet. Thanks Sue. Practice does make perfect. I bet your faces aren't as bad as you think. And even if they aren't quite right yet, if you want to draw them, keep trying and keep looking at pictures of faces. I am delighted to have you on board Chris. Thanks for those lovely comments. WOW. 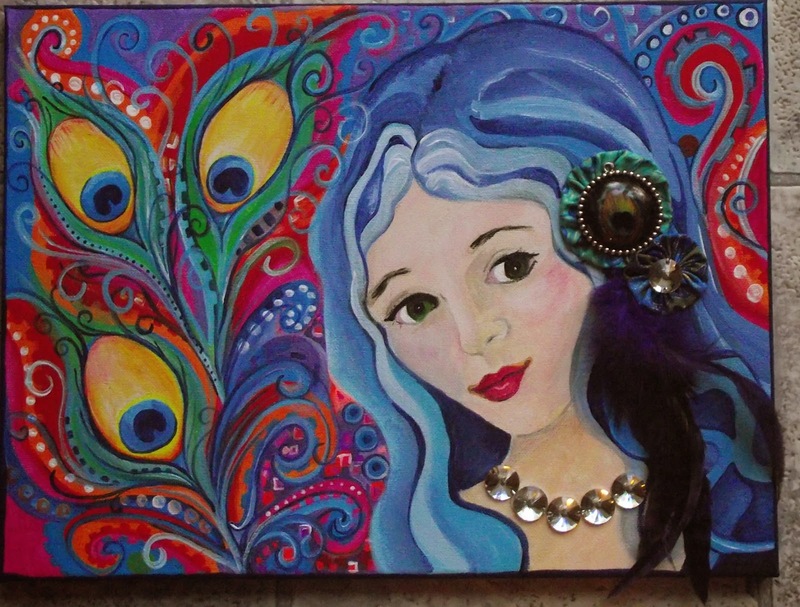 I just love to paint and draw and what could be better than to play with art and document my stages in life? What a stunning creation! The drawing is amazing! I love these pastel tones! Bravo!